In February I spent a couple of days in New York hanging out with friends and attending the HSMAI Awards with Diamond PR. 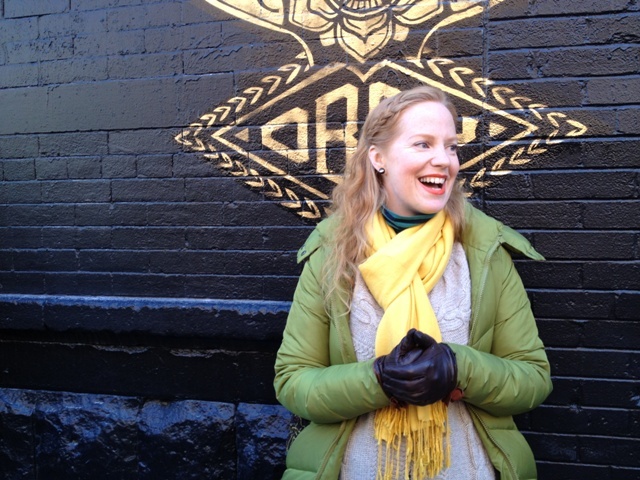 I had a bit of spare time and after loving the Savor Seattle Food Tour in Seattle so much the month before I was excited to find an awesome food tour in New York, one of the best places to grab a bite to eat in the world. After some google searching I came across Foods of New York Tours and booked their Nolita food tour. Nolita stands for “North of Little Italy”, a lovely little neighborhood in Manhattan. On the tour we learned a lot of history about the area from seeing where Martin Scorsese went to school and the church he filmed the Godfather in to Will Smith’s apartment, the former place of the famous music club CBGB, Thomas Edison’s Laboratory and a whole lot more along with all of the DELICIOUS FOOD! The tour began at the Little Cupcake Bakeshop where we met our fabulous tour guide Anny. 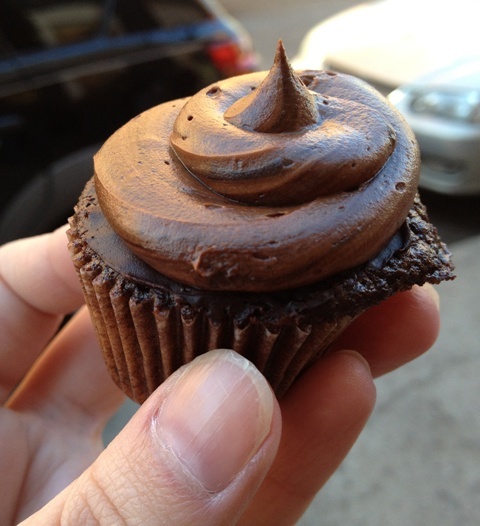 The first thing we were served up was of course a yummy cupcake! Known as the “Brooklyn blackout cupcake” it was one of those cupcakes that looks almost too good to eat. After the cupcakes were gobbled up Anny handed us all complimentary water bottles included in the tour along with one of many napkins we would need along the way. Our next stop was not too far down the block and across the street which I was excited about because I hadn’t eaten any food in preparation for the tour and my stomach was starting to grumble. From the front Emporio on Mott Street didn’t look like too much but as we walked in past the kitchen where the awesome food smells were wafting from to the back of the restaurant where there was a rustic feel with a ceiling full of skylights and the Pièce de résistance the wood fired oven. 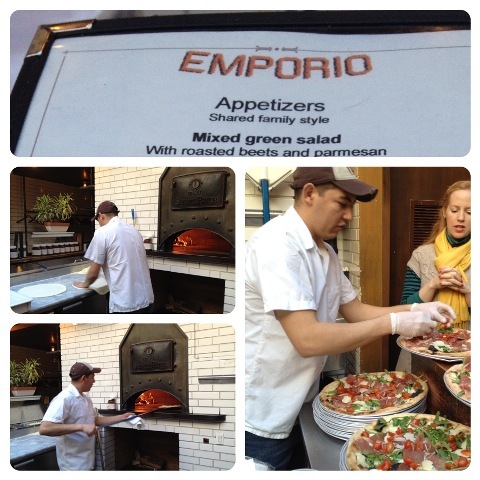 Emporio has a Pizzaiolo whose sole job is to make Pizzas. That’s not a bad job to have, especially when you are really really good at making them like their Pizzaiolo was. If you haven’t guessed it yet this was probably my favorite spot on the whole tour. 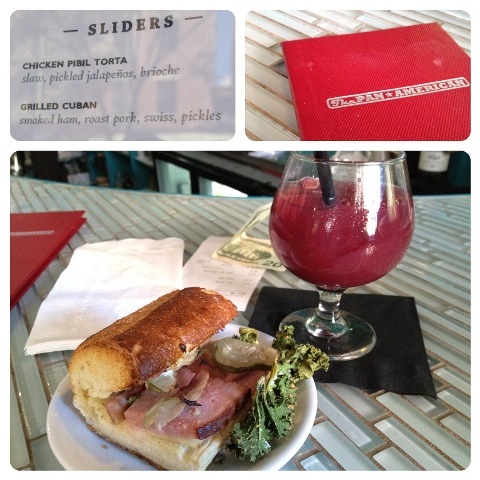 After Emporio we headed across the street and a few doors down to a Cuban restaurant called “The Pan American“ for none-other than a “Cuban” sandwich, with a side of kale chips and I couldn’t resist purchasing myself a Sangria to wash it all down. Next we had a bit of a walk but it was full of lots of information as we walked passed Lombardi, the oldest pizza place in North America, we visited an old fashioned barber shop, learned about some other popular restaurants in the area like “Public Restaurant” until we came upon Tacombi. 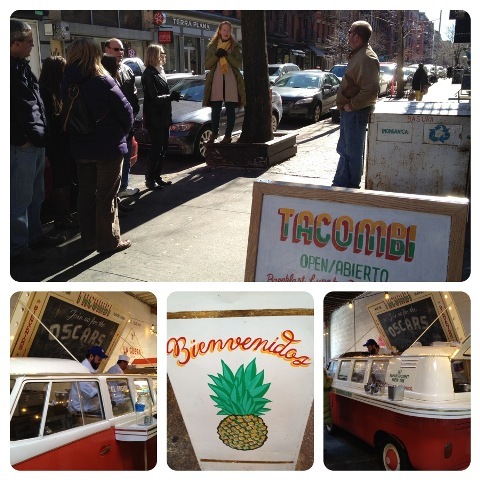 Tacombi was one of the coolest places we visited on the tour because the food is literally cooked in a food truck that is parked indoors. A re-vamped VW van to be exact, so small that the roof has been removed so the chefs can stand upright inside of it to cook. In the summer time the front doors of the restaurant open like garage doors making it feel like you are really ordering from the street. 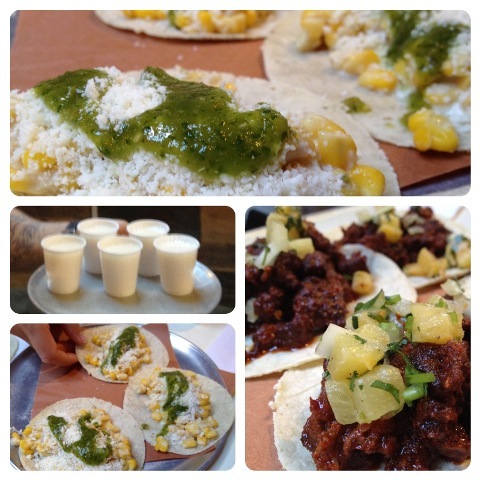 At Tacombi we ate a corn taco and a pork taco with pineapple on top and washed it down with some horchata. All was delicious and even though I didn’t get to try it I would definitely go back to Tacombi to try their guacamole made fresh daily. At this point of the tour I was started to get stuffed. The great food just kept coming and coming but there were still two more stops. 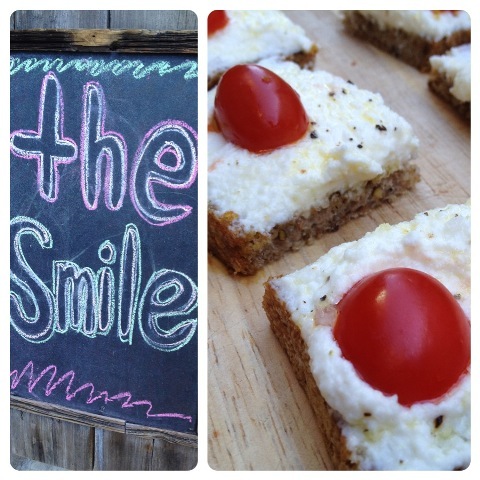 A cute restaurant below the street called “The Smile“ served us up some apps with riccotta on a multi grain bread topped with a tomato. Yes, yes it was as good as it looks. After “The Smile” we headed for our last stop of the tour called “Peels“. At “Peels” there was a line up out the door, a very popular location especially after recently being featured on the Martha Stewart Show. 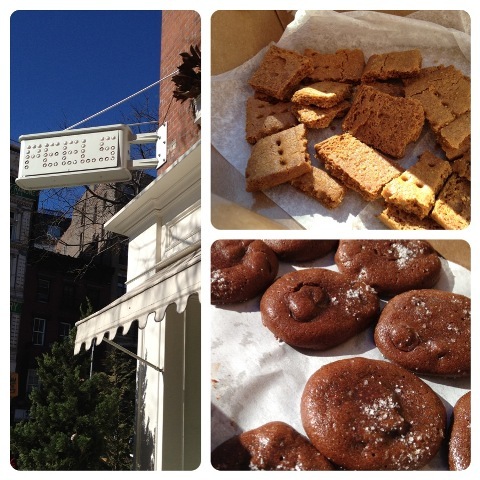 We were meant to finish the tour with their chocolate and sea salt cookies however they were still baking so we were held over with homemade graham cracker cookies until the hot delicious chocolate sea salt cookies were ready. The Foods of New York Nolita tour ended in one of the best ways I’ve ever seen a tour end, with the tour guide singing a song to us. Anny an aspiring singer / actress definitely knows how to sing a tune. If you can’t tell already I haven’t a bad word to say about the Nolita food tour and I definitely recommend it to anyone that is visiting New York. 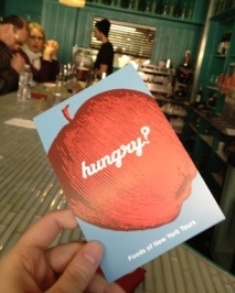 Thanks to the Foods of New York Food Tours for hosting me on this tour. 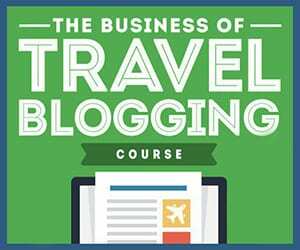 Make sure you fly to New York soon to check them out! Have you ever taken a food tour? Where in the world is your favorite? Thanks again for the writeup, Cailin. You’ve got some great pictures here! 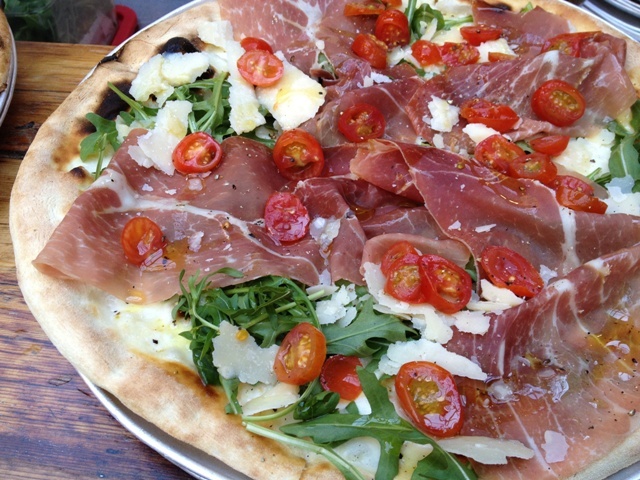 We’ve never taken a formal food tour, but we’ve led many informal food tours through Nolita! The tour sounds like a lot of fun and as long as it features the delicious food in NoLita, we are definitely interested!